Over 14+years experience selling, installing and creating additional garage storage space. We're committed to 100% satisfaction from all our customers. We are a owner/operator business and thus when you're dealing with us, you're dealing with the people that will get things done and truly care about your project. Whether you're looking for top of the line garage storage or a garage floor coating or both, we install it with your ultimate satisfaction in mind. Please feel free to drop us a line and we'll be more than happy to visit you anywhere in the greater Seattle area to discuss your project and give you a free estimate. "C.C.G. is truly Exceptional and delivers the Highest-Quality product and service. " We specialize in optimizing the use of your garage space. We carry the world class standard of excellent storage systems, ONRAX overhead storage. These are truly amazing products that have functionality, value and durability. We combine design ideas and installation to ensure your 100% satisfaction with your new space! We also specialize in garage floor coatings. 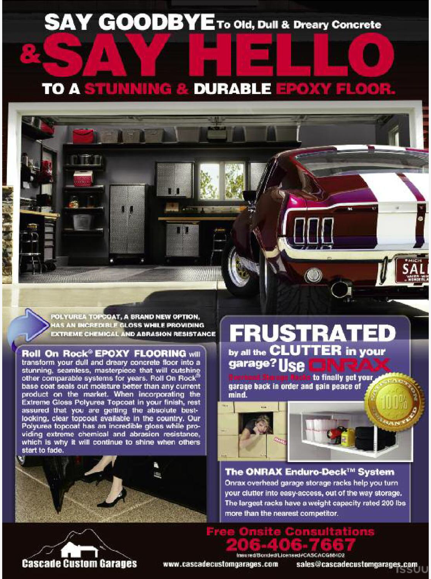 These add tremendous value to your floor and beauty to your garage, They also add a rock solid layer of durability to your garage floor. With so many styles and coatings available to choose from, you'll be sure to get exactly what you want.